MvcScaffolding is a tremendous productivity improvement for MVC developers. Earlier this year, Steve Sanderson posted the definitive 7-part series on MvcScaffolding which is a must-read for anyone serious about doing scaffolding. The best part about the scaffolding infrastructure is that MvcScaffolding is actually built on top of another package called T4Scaffolding. T4Scaffolding can be used as the basis for *any* scaffolding – not just MVC projects. 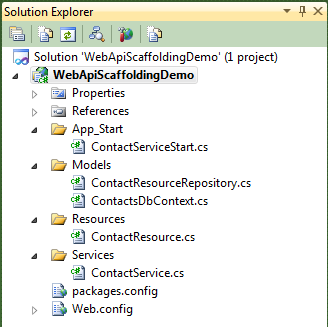 To that end, we can enjoy the same power of MvcScaffolding in non-MVC projects like the WCF Web API. State was held by a static in-memory dictionary which, while good for a demo, you have to replace. It created a dummy “MyModelType” class where you had to then rely on Visual Studio refactoring tools to perform a “rename” operation everywhere. You have to manually move the model type to its own code file. You have to manually rename the Service class. You have to manually specify the route you want. It only created a single service – so if you want to create a second service, it was a copy/paste exercise. By leveraging T4Scaffolding, we can address all of these issues. I’ll start with the end result and then discuss the implementation. And just like that, all 6 of our “less than ideal” aspects from before are addressed. Let’s take a closer look at what was generated. By convention it just has an Id and we can add in any other properties we want without affecting the service or data access. More importantly if you already have a type that you want to expose, you can just specify the existing type for the ModelResource and it will use that and will not overwrite the class. 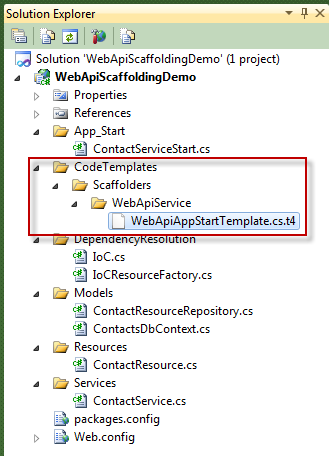 Notice that we are using the WebActivator library which automatically invokes our initialization code during application start up for an ASP.NET application. Also notice that the route of “contacts” was created automatically by pluralizing the model type (and removing the word “Resource” from the end). All of this was generated automatically with no need to customize. Additionally, if we want to create another service, we just scaffold again – no copy/paste required. 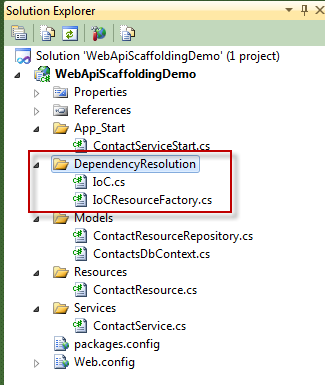 These files include the initialization of the IoC container as well as a Web API Resource Factory that uses it. The Web API Scaffolder has a dependency on StructureMap so the StructureMap NuGet package is a dependency that is automatically added when you add the WebApi.Scaffolding NuGet package. Of course, you can always replace this with your IoC of choice. This command not only creates the repository for me but also the Entity Framework DbContext – this all comes built-in with T4Scaffolding! 2:  $appStartName = "App_Start\$ServiceName" + "Start"
The $route variable on line #1 now is “contacts” which gets passed into the T4 template for the ServiceRoute on line #7. Next time you run the Scaffold WebApiService… command, it will automatically pick up the changes in your locally customized T4 template. T4Scaffolding gives you a HUGE amount of power and control when building your own solutions. It is well worth your time to familiarize yourself with the tools available to you and you will be amazed to find new ways to increase your productivity that you hadn’t before thought of. The sky is the limit for the different types of “recipes” you can create for yourself. 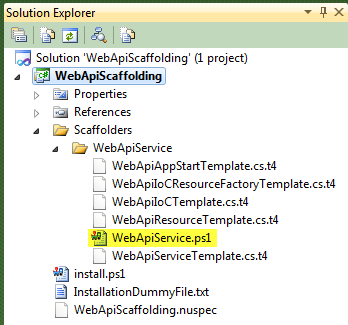 The WebApi.Scaffolding package is available on NuGet. The complete source code can be found on CodePlex. Thanks to everyone who attended my presentation last night at TriNUG. The code samples as PowerPoint can be downloaded here.